Patch 1.29 brings a raft of welcome changes. 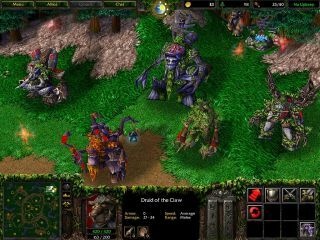 A major new update for Warcraft 3 has rolled out for testing. Now old enough to get a provisional driving license, the 16-year-old RTS now boasts 24-player servers and—finally—native widescreen support. And there's more to come, it seems. "Warcraft III's PTR is back and ready for your scrutiny," writes developer Peter Stilwell. "Join us in testing widescreen support, hero balance changes, and updates to Map Pools for 1's, 2's, 3's, 4's and Free-for-All. We've also added some experimental modes like 24 player support for custom games." For the full details—and there's a lot of them, including buffs, nerfs, and balance tweaks—visit the official forum thread. It might seem a little odd for a game this old to be getting such an update now, but following the PTR launched last year, the patch rolled out in 2016 (the first for half a decade), and the recently announced a Warcraft III invitational, it's clear Blizzard isn't giving up on its older titles just yet. More evidence that Blizzard will announce Warcraft III Remastered some time soon? Maybe. But for now, this update is all we have.